The technologically advanced lid features a viewing/feeding window on the top with two dark tubes with clear caps and flappers that cover opening when cylinders are removed and a carry handle. Protein, vitamins and minerals are a life sustaining need for many reptiles, amphibians and birds. Crickets are the most widely available food source for many of these domestically maintained animals. In the past, crickets were difficult to keep for any length of time. 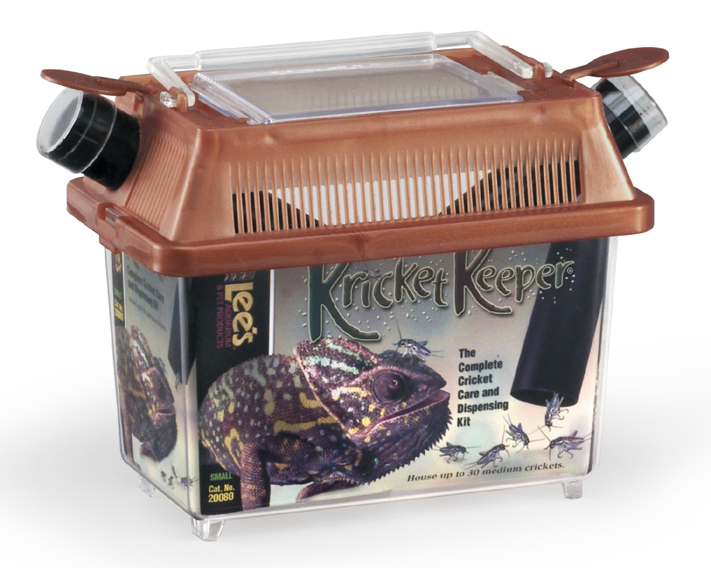 Now, with Lee's Kricket Keeper, hobbiest may maintain up to 30 medium crickets for a week or longer. Crickets naturally gravitate to dark places. The two dark cylinders provide an ideal hiding place for the crickets, while also allowing for easy closing when feeding animals. Simply slide the cylinder out of the keeper and drop the flapper down to prevent escapees. If needed, cover the cylinder opening with one hand while moving to the animal that you are feeding. Remove your hand and lightly tap on the cylinder to release the appropriate number of crickets for feeding. Cover opening and return to keeper. One cylinder should be removed at a time to avoid crickets escaping. Crickets should be kept in a well-ventilated area at a temperature range between 70-75 degrees with low humidity. Keep out of direct sunlight and cold drafts. Keeper should be kept clean and dry. Premium Cricket food and water gel should be provided at all times. Both of which should be provided in the shallow food and water dishes provided. If water gel is not available a sponge may be used. Do not fill bowl with water since the crickets may drown. Crickets produce quite a bit of waste and so it is necessary to clean the unit after each use. Remove any deceased crickets, shed skin or waste and clean the entire unit with hot tap water. Never use soap or detergents since it may leave a residue that can be harmful or even deadly to the crickets.